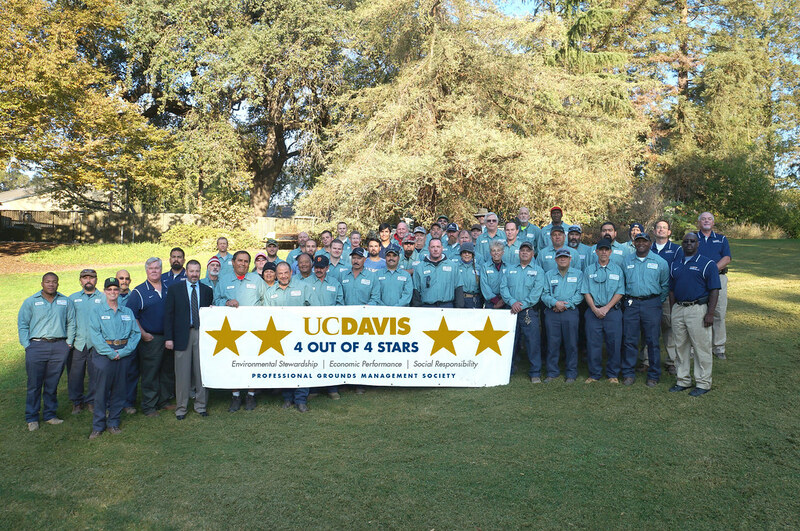 The UC Davis Grounds and Landscape Services team is recognized as one of the best, large-scale institutional landscape practices nationally and internationally and is accredited by the Professional Grounds Management Society with a 4-out-of-4 star ranking for their environmental stewardship, economic performance and social responsibility practices. The UC Davis Arboretum and Public Garden's Grounds and Landscape Services team is a leader in large-scale landscape management. Our professional service employees include laborers, operation engineers, irrigation specialists, sports turf experts and arborists. The green inventory we nurture and maintain includes more than 14,000 trees comprising over 100 species, 300 acres of lawn/turf, 50 acres of shrubs and 25 acres of groundcover which together sequester 640 tons of carbon annually.